This is what you need to do: Remove (or comment out) this whole section in the applicationContext-security.xml file. This section is found on the line 74 and forth. You need of course to replace my settings with yours, notably : url, port, group-search-base, user-search-base and filters. The most important think is the location of authentication-manager and ldap-authentication-provider as well as location of the ldap-server tag, which is located outside these tags. I have changed location of groups from the last post, but that is just a work in progress. You can also note that I am using anonymous LDAP access, because I do not think that wiki needs to know my LDAP admin account when it only performs read operations. If you do not want to use anonymous access, you just add admin info. All the roles are described on JAMWiki's web. 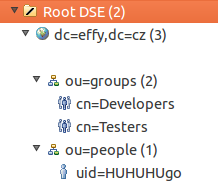 I have entered them into LDAP in upper case (ADMIN, VIEW, etc.) and it works. These roles are created exactly like roles in my Jenkins post. 1) You will not be able to modify or add users trough wiki's interface. Or more precisely (and sadly) ... you will, it just won't affect the LDAP, but just the wiki's database which is not than used for user autorization and authentization. 2) The same applies to the roles. I believe, that the only working configuration of roles is the one dealing with GROUP_ANONYMOUS. Configuring JAMWiki for using LDAP as the security back end is really easy when you have a proper xml. But it severely limits wiki's ability of managing users and roles. I do not think that it is a bad thing, but it is certainly something you need to count with. I do like it and I will keep my users managed in LDAP instead of the internal wiki's database. I have never heard before about this approach. As far as I understand, this all is about cyber security which is a need for business today. The purpose is similar to the one used by virtual data room service providers, to provide highly-protected repositories for business data.